In this age of WebMD, many of us find ourselves self-diagnosing conditions before we’ve even seen a doctor. Armed with Internet search results, we often go to the doctor thinking we know exactly what the diagnosis will be. Of course, diagnosing a medical condition is a much more complicated process. 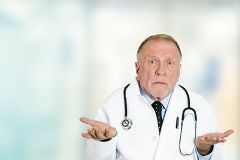 Years of knowledge and experience, supported by high-tech test results, go into a doctor’s determination of what, if anything, is wrong with you. Unfortunately, just like us on WebMD, doctors can get it wrong. In fact, the most common medical malpractice claims are made for missed diagnoses of serious conditions. Cancer. Many types of cancer are missed 28 percent of the time, while some cancers are missed as much as 44 percent of the time. Lymphoma, breast cancer, sarcomas, and melanomas are most often missed or misdiagnosed. Once the condition is correctly diagnosed, valuable time to cure the cancer has been lost. Heart attack. Symptoms of a heart attack can differ among victims. Older people may just feel something akin to indigestion while a younger victim may feel a crushing pain. Heart attacks in women also present very different symptoms from men. When early warning signs are missed, heart attacks can become fatal. Stroke. Young adults displaying symptoms of a stroke are often misdiagnosed by doctors. Mistaken for vertigo, intoxication, or migraine, valuable time to save the patient’s life is lost when a misdiagnosis is made. Researchers estimate that early signs of a stroke are missed in tens of thousands of Americans each year. Pulmonary embolism. A recent study found that 33.5 percent of patients with pulmonary embolism in 2013 were sent home or admitted with an incorrect diagnosis. Often mistaken for heart attack or pneumonia, a pulmonary embolism—a blood clot in the lung—can be fatal if not treated quickly. Doctors often cite lack of time with a patient, incomplete medical history, and fragmented or missing information from patients as reasons for missing an initial diagnosis. These reasons do not absolve a doctor of responsibility, however. If you are the victim of a missed or incorrect diagnosis, call our experienced medical malpractice attorneys now.